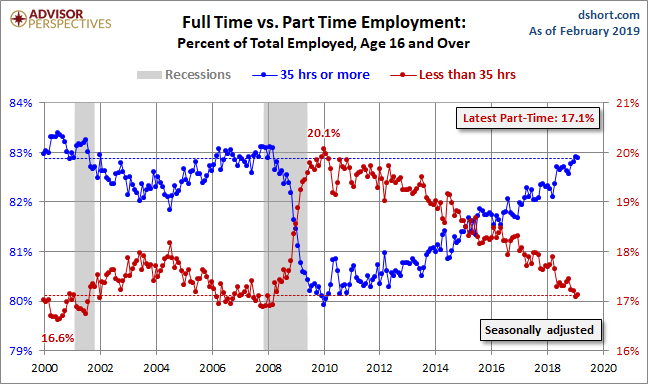 Let's take a closer look at the latest employment report numbers on Full and Part-Time Employment. 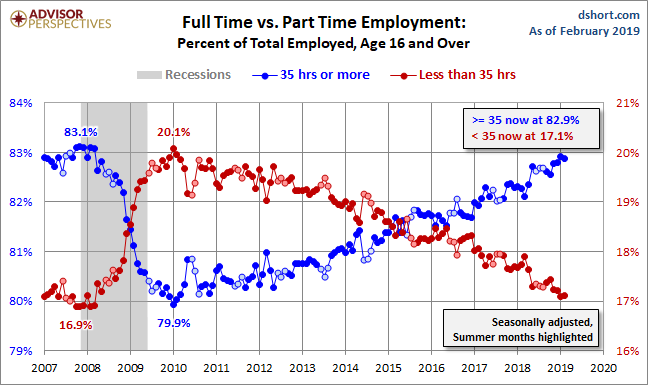 Buried near the bottom of Table A-9 of the government's Employment Situation Summary are the numbers for Full- and Part-Time Workers, with 35-or-more hours as the arbitrary divide between the two categories. The source is the monthly Current Population Survey (CPS) of households. The focus is on total hours worked regardless of whether the hours are from single or multiple jobs. The Labor Department has been collecting this since 1968, a time when only 13.5% of US employees were part-timers. That number peaked at 20.1% in January 2010. The latest data point, over eight years later, is lower at 17.1% last month.